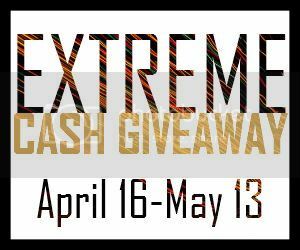 It’s time for the April Extreme Cash Giveaway! This month’s prize is... a $500 Paypal cash prize! There are many entry options and daily entries as well, so keep this page bookmarked so you can come back every day to increase your chances of winning. I got out of bed at 7:30 on a Saturday! Extreme, not much! A walk to the playground. I took my cat to the vet. i raked up fall leaves, even though it's spring! I ate a questionable hot pocket. I swam in the lake. Taking car for an oil change... after that, not sure what fun things will happen. I got up at 4:45 and called in sick then went back to bed. Booked flights :-) But it's 4 PM here right now, so might be something more extreme to come, haha. The most extreme thing I've done today is not separate my colors from my whites in the washing machine. I studied mitochondrial disease on the internet since my doctor thinks I have one. My day has been pretty relaxing. So I guess that the most extreem thing I did today was walk to the gym only to find out it closed 5 minutes before I got there, and so I walked back home. I ran to the store! The most extreme thing I've done today was the "Gilad Cuts and Curves" workout DVD. The most extreme thing I've done today would have to be getting a really short haircut. I ate at the wrong restaurant apparently because it's done a number on my indigestion. Most extreme thing I did today was stay up way too late. I camped out in the living room with my children. rode big thunder mountain railroad! extreme... hmm.... does a ride in the car count?